Yesterday I ran up to the Outlet Mall near our house to return a few items. Much to my bank accounts disgust, there is a new Toys R Us express there!! I went in convinced I would not buy anything as I have Eliza's Christmas and Birthday shopping done. Well 30 minutes later I walked out with ANOTHER Elmo and a pig that oinks and walks...both definitely needed. When I got home I called Mark and asked him to bring Eliza down so she could drive in the garage. Yep, we are weird, we allow her to "drive" the car. This started when she was really little, her and I would wait for Mark at the end of the driveway when he got home from work. 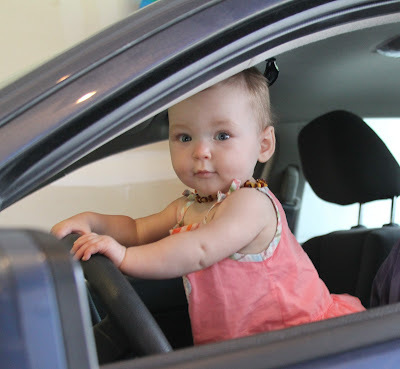 We would pass her through the window(getting harder as she gets bigger) and she would drive into the garage. Anyway, Mark brought her down, passed her in, and the first thing she saw was the box for the walking pig...I guess I didn't hide it well enough. She started squealing, just like a pig. Once we parked I let her see the box, she snuggled it and patted it on the back, she was thrilled. When we got in we took it out of the box, she looked at it for a minute and moved on. I told myself it was because it had no batteries and she didn't see the real potential of the pig. Please note: Eliza does not literally drive the car, she holds the wheel and screams the whole time. We do not press the accelerator, only allow the car to coast in the driveway. Her favorite part is turning up the music...yep she knows where the knob is. Later that night I brought the bag with Elmo in it into the house and set it on the counter. Not realizing it was in her direct line of vision I put Eliza in her high chair. Let me explain Elmo...Elmo trumps mommy-daddy-Zander-food-life in general, so when she saw that Elmo she lost it. I bought her Hokey Pokey Elmo, she already has Tickle Me Elmo and my mom got her the new Rock Elmo for Christmas. I agreed to let her see it, in the box, and then we would put it away for Christmas. As I took it out of the bag she started to shake uncontrollably, something I have never seen before. I pressed the button to make him dance and she lost it, I thought she was going to cry she was so excited. Due to this reaction I thought it was best to take it out of the box so she could see the full effect, and so we could get it on video. As I took it out of the box, which took 10 minutes because they package things so ridiculously, she continued to shake. We got it out, put her on the ground and she tackled it. She watched it dance a bit, which is a little creepy, and then she crawled away...UM EXCUSE ME MA'AM you were just loosing it over this thing. Well, we continued to try to keep her interested but she would only stay for a minute or so then move on. I can't expect much from her so I didn't care. A little while later Mark was cleaning up the kitchen and went to throw the Elmo box away, she had a fit. She started to cry like we were throwing Elmo away. Why is this child more interested in boxes then the toys I paid for?? I will happily go to the grocery store and collect the empty stocking boxes if that is what she would like instead of spending $31.99 on a toy she hasn't looked twice at! Please tell me this has happened to you, that in a few days/weeks/months she will come back to it and be thrilled!! Kids are so funny. My daughter was crazy about Elmo, then we bought her one and she didn't want anything to do with it for several months. Now she gets super attached to one or two dolls, then ignores them, and gets attached to something else. Sometimes I wonder why we bother with toys too because our kids seem to like cardboard boxes, tissue paper and Tupperware better than anything else. LOL! My daughter had the same reaction to the Elmo doll. Following from Sasse life Sunday Social.